RuBe’s Closet - Modest Fashion and Lifestyle: Hello 2015! Welcome to 2015 beautiful readers! It’s been a long and rewarding break for me and my family. It feels as if I have been on holiday forever, and I’m somehow struggling to get into the groove of reality. This week, getting my kids textbooks and stationery certainly gave me that wake up call that I so dearly needed. Back to the real world of schedules, obligations, commitments and so on and so on…. My holiday started the day after school closed, we literally flew out before the kids reports had even arrived! It was a wonderful anniversary trip (more to follow in another blog post), and followed by our usual timeshare getaway to Pine Lake Marina with my sister and family. It really feels like home away from home- except without all the duties of being Mum at home hehe. I had ample time to reflect on the 2014 year, to appreciate the highs, to weigh up the lows - and basically give thanks for all the wonderful experiences. I am so grateful for all the wonderful people in my life, who bring smiles and sunshine in different ways and make each day a gift. I don’t do New Years resolutions, but I always endeavour to learn a new skill or experience something new and if I’m lucky, see a place I never have. I would like to say thank you to all my readers for taking the time to visit my page, to comment and interact with me on social media. It’s really appreciated! May you guys have a wonderful and prosperous 2015! And onto a lookpost from 2014… Whilst on holiday I saw kimonos everywhere, probably because they are so versatile and can be dressed up or down. The relaxed fit trend is continuing into 2015 and I love it! 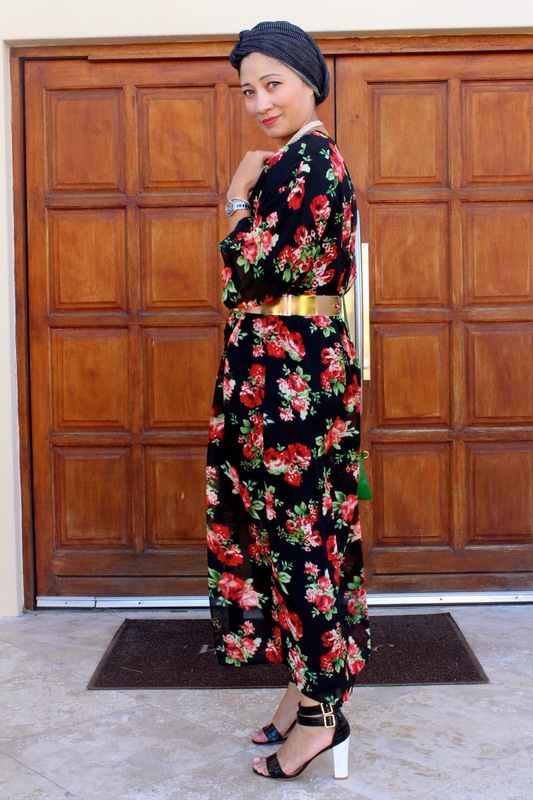 Today’s look features a gorgeously floral Minimal Exposure kimono dressed up with heels and accessories. Sometimes I wonder if Ihsaan looks more like his father or you. But that 4th image above looks like him and the way he smiles at times. So glad that you are back, sorry for experiencing the madness of "back to school" vibes. It is true, these kimonos are in fashion and is a must have summer piece. It sure is gorgeous.